The Chinese ecommerce giant has been charging ahead since floating in September. It's less than three months since the Chinese ecommerce giant Alibaba floated on the New York Stock Exchange, but its investors will be chomping at the bit to find out how well it's performed. Today's results, the first since the record-breaking IPO, show that even an absolute behemoth can still continue to grow – but for how long? 1. Revenues: In the three months to September revenues hit RMB16.8bn (US$2.7bn or £1.7bn), slightly higher than the $2.6bn expected by analysts. Revenue grew by 53.7% compared to last year, a remarkable figure for such a large company. 2. Profits: Profits actually dipped this quarter by 38.6% to $494m, which it blamed on the 'significant increase in share-based compensation expense' due to strong performance. It's unclear whether these will be recurring. 3. Goods sold: Alibaba provides marketplaces for other sellers, rather than selling its own products so the amount of business done through its websites is much greater than its own revenues. 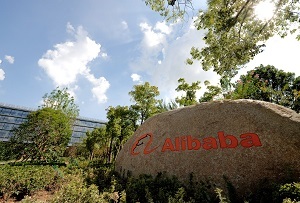 The total value of goods sold via Alibaba grew by 49% to $90.1bn year-on-year. 4. Mobile users: Alibaba has been pushing to keep up with smartphone adoption, encouraging more people to use its apps. Today it reported 217 million monthly active users on its mobile apps, up from 188 million in June. The 29 million increase is equivalent to more than the entire populations of the Benelux countries – in just three months. 5. Share Price: Shares in the company have been trading around 45% higher than its listing price before today and it recently overtook Walmart to become the world's most valuable retail business. Shares grew by around 4% in pre-market trading but at last check were down by 9.8% at $100.80. Presumably investors were hoping for better profit growth as well as great revenues.